Home BUSINESS TECHNOLOGY REVOLUTION: Is it time Kenya used recycled plastic to build stronger roads? REVOLUTION: Is it time Kenya used recycled plastic to build stronger roads? 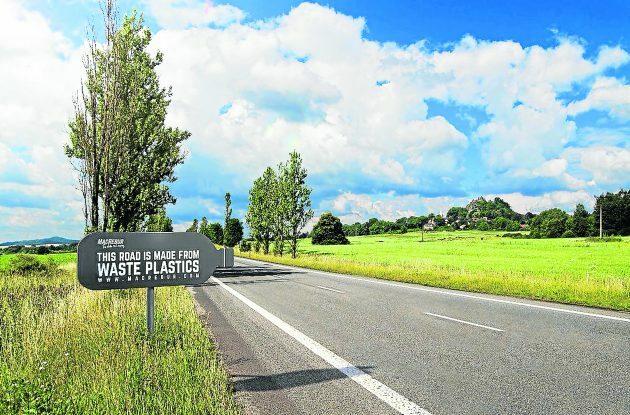 Have you ever imagined if all the plastics we disposed could be turned into roads? Imagine constructing a road that would last ten times as long within days instead of months. That maintenance and traffic disruption are things of the past. And that cable and piping problems as well as the urban water problem are solved overnight. This may sound like a scenario in the distant future, but nothing could be further from the truth. A British engineer Toby McCartney has devised an innovative process to replace much of the crude oil-based asphalt in pavement with tiny pellets of plastic created from recyclable bottles. The result is a street that is 60% stronger than traditional roadways, 10 times longer-lasting and a heck of a lot better for the environment. If implemented, his idea can solve more than one problem: poor road quality, the continued use of fossil fuels and the plastic waste epidemic. These roads are cheaper to make and are less prone to getting potholes thus last longer than conventional roads. They are a greener alternative to asphalt that is stronger, easier to maintain, and more resistant to temperature extremes than conventional blacktop. McCartney’s mix replaces most of the bitumen, a material extracted from oil that is used as a binding agent in normal roads with plastic pellets. The pellets are made from waste that is destined for landfills, such as the polyethylene that is used in packaging. The plastic waste pellets are then mixed with the usual rocks and a small amount of bitumen at the asphalt plant. The process is exactly the same, no plants don’t need any new equipment. Typical roads are made of about 90% rock and sand with 10% bitumen. This new technology essentially bulks up the bitumen with recycled waste plastic, so the roads are stronger and less of the oil product is required to bind together rocks. The plastics involved in building these roads consists mainly of common post-consumer products such as product packaging. And in a country like Kenya, this can be a very important avenue to help it in its resolve to tackle the plastic waste problem and improve the road infrastructure that is way behind in development. These materials are first sorted from plastic waste, cleaned, dried, and then shredded. The shredded plastic is mixed and melted at around 170°C before hot bitumen is added and then mixed with the melted plastic. The mixture is then laid as one would with regular asphalt concrete. Building roads entirely from plastic opens new possibilities in construction as proposed by a Dutch company, Volkerwessels, which aims to create roads entirely of recycled plastic. Construction can be significantly more efficient, since roads can be created as individual pieces, which can be switched out in case of damages. This is different from traditional ways of road repair, which requires long time spent on site shaping asphalt to the desired shape. Pure plastic road requires using compatible plastics because, when melted, plastics of different types may phase-separate and cause structural weaknesses, which can lead to premature failure. Secondly, the wear and tear can create harmful plastic particulates which can worsen current micro-plastic pollution problem.